Telecommunications in North Korea refers to the communication services available in North Korea. North Korea has not fully adopted mainstream Internet technology due to its isolationist policies. North Korea has an adequate telephone system, with 1.18 million fixed lines available in 2008. However, most phones are only installed for senior government officials. Someone wanting a phone installed must fill out a form indicating their rank, why he/she wants a phone, and how he/she will pay for it. Most of these are installed in government offices, collective farms, and state-owned enterprises (SOEs), with only perhaps 10 percent controlled by individuals or households. By 1970 automatic switching facilities were in use in Pyongyang, Sinŭiju, Hamhŭng, and Hyesan. A few public telephone booths were beginning to appear in Pyongyang around 1990. In the mid-1990s, an automated exchange system based on an E-10A system produced by Alcatel joint-venture factories in China was installed in Pyongyang. North Koreans announced in 1997 that automated switching had replaced manual switching in Pyongyang and 70 other locales. North Korean press reported in 2000 that fiber-optic cable had been extended to the port of Nampho and that North Pyong'an Province had been connected with fiber-optic cable. In November 2002, mobile phones were introduced to North Korea and by November 2003, 20,000 North Koreans had bought mobile phones. In December 2008, a new mobile phone service was launched in Pyongyang, operated by Egyptian company Orascom, with current plans to expand coverage to all parts of the country. The official name of the 3G mobile phone service in North Korea is called Koryolink, and is a joint venture between Orascom and the state-owned Korea Post and Telecommunications Corporation (KPTC). There has been a large demand for the service since it was launched. In May 2010, more than 120,000 North Koreans owned mobile phones; this number had increased to 301,000 by September 2010, 660,000 by August 2011, and 900,000 by December 2011. Orascom reported 432,000 North Korean subscribers after two years of operation (December 2010), increasing to 809,000 by September 2011, and exceeding one million by February 2012. By April 2013 subscriber numbers neared two million. By 2015 the figure has grown to three million. 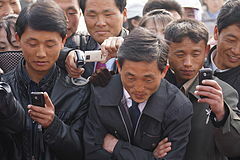 In 2011, 60% of Pyongyang's citizens between the age of 20 and 50 had a cellphone. On June 15, 2011, StatCounter.com confirmed that some North Koreans use Apple's iPhone, Nokia's and Samsung's smartphones. In November 2011, no mobile phones could dial into or out of the country, and there was no Internet connection. A 3G network covered 94 percent of the population, but only 14 percent of the territory. Past restrictions included a ban on cell phones from 2004–2008. Koryolink has no international roaming agreements. Pre-paid SIM cards can be purchased by visitors to North Korea to make international (but not domestic) calls. Prior to January 2013, foreigners had to surrender their phones at the border crossing or airport before entering the country, but with the availability of local SIM cards this policy is no longer in place. Internet access, however, is only available to resident foreigners and not tourists. North Korean mobile phones use a digital signature system to prevent access to unsanctioned files, and log usage information that can be physically inspected. North Korea has had a varying number of connections to other nations. Currently, international fixed line connections consist of a network connecting Pyongyang to Beijing and Moscow, and Chongjin to Vladivostok. Communications were opened with South Korea in 2000. On May 2006 TransTeleCom Company and North Korea's Ministry of Communications have signed an agreement for the construction and joint operation of a fiber-optic transmission line in the section of the Khasan–Tumangang railway checkpoint in the North Korea-Russia border. This is the first direct land link between Russia and North Korea. TTC's partner in the design, construction, and connection of the communication line from the Korean side to the junction was Korea Communication Company of North Korea's Ministry of Communications. The technology transfer was built around STM-1 level digital equipment with the possibility of further increasing bandwidth. The construction was completed in 2007. Since joining Intersputnik in 1984, North Korea has operated 22 lines of frequency-division multiplexing and 10 lines of single channel per carrier for communication with Eastern Europe. and in late 1989 international direct dialing service through microwave link was introduced from Hong Kong. A satellite ground station near Pyongyang provides direct international communications using the International Telecommunications Satellite Corporation (Intelsat) Indian Ocean satellite. A satellite communications center was installed in Pyongyang in 1986 with French technical support. An agreement to share in Japan's telecommunications satellites was reached in 1990. North Korea joined the Universal Postal Union in 1974 but has direct postal arrangements with only a select group of countries. Following the agreement with UNDP, the Pyongyang Fiber Optic Cable Factory was built in April 1992 and the country's first optical fiber cable network consisting of 480 Pulse Code Modulation (PCM) lines and 6 automatic exchange stations from Pyongyang to Hamhung (300 kilometers) was installed in September 1995. Moreover, the nationwide land leveling and rezoning campaign initiated by Kim Jong-il in Kangwon province in May 1998 and in North Pyongan province in January 2000 facilitated the construction of provincial and county fiber optic lines, which were laid by tens of thousands of Korean People's Army (KPA) soldier-builders and provincial shock brigade members mobilized for the large-scale public works projects designed to rehabilitate the hundreds of thousands of hectares of arable lands devastated by the natural disasters in the late 1990s. Broadcasting in North Korea is tightly controlled by the state and is used as a propaganda arm of the ruling Korean Workers' Party. The Korean Central Television station is located in Pyongyang, and there also are stations in major cities, including Chŏngjin, Kaesŏng, Hamhŭng, Haeju, and Sinŭiju. There are three channels in Pyongyang but only one channel in other cities. Imported Japanese-made color televisions have a North Korean brand name superimposed, but nineteen-inch black-and-white sets have been produced locally since 1980. One estimate placed the total number of television sets in use in the early 1990s at 250,000 sets. A study in 2017 found that 98% of households had a TV set. Visitors are not allowed to bring a radio. As part of the government's information blockade policy, North Korean radios and televisions must be modified to receive only government stations. These modified radios and televisions should be registered at special state department. They are also subject to inspection at random. The removal of the official seal is punishable by law. In order to buy a TV-set or a radio, North Korean citizens are required to get special permission from officials at their places of residence or employment. North Korea has two AM radio broadcasting networks, Pyongyang Broadcasting Station [ko] (Voice of Korea) and Korean Central Broadcasting Station, and one FM network, Pyongyang FM Broadcasting Station [ko]. All three networks have stations in major cities that offer local programming. There also is a powerful shortwave transmitter for overseas broadcasts in several languages. The official government station is the Korean Central Broadcasting Station (KCBS), which broadcasts in Korean. In 1997 there were 3.36 million radio sets. Kwangmyong is a North Korean "walled garden" national intranet opened in 2000. It is accessible from within North Korea's major cities, counties, as well as universities and major industrial and commercial organizations. Kwangmyong has 24-hour unlimited access by dial-up telephone line. A survey in 2017 found that 19% of households had a computer, but that only 1% nationally and 5% in Pyongyang had access to the intranet. In August 2016, it was reported that North Korea had launched a state-approved video streaming service which has been likened to Netflix. The service, known as "Manbang" (meaning everyone) uses a set-top box to stream live TV, on-demand video and newspaper articles (from the state newspaper Rodong Sinmun) over the internet. The service is only available to citizens in Pyongyang, Siniju and Sariwon. The state TV channel Korean Central Television (KCTV) described the service as a "respite from radio interference". In 2018, North Korea unveiled a new wi-fi service called Mirae ("Future"), which allowed mobile devices to access the intranet network in Pyongyang. North Korea's main connection to the international Internet is through a fiber-optic cable connecting Pyongyang with Dandong, China, crossing the China–North Korea border at Sinuiju. Internet access is provided by China Unicom. Before the fiber connection, international Internet access was limited to government-approved dial-up over land lines to China. In 2003 a joint venture between businessman Jan Holterman in Berlin and the North Korean government called KCC Europe brought the commercial Internet to North Korea. The connection was established through an Intelsat satellite link from North Korea to servers located in Germany. This link ended the need to dial ISPs in China. In 2007 North Korea successfully applied at ICANN for the .kp country code top-level domain (ccTLD). KCC Europe administered the domain from Berlin, and also hosted a large number of websites . In 2009 Internet service provider Star Joint Venture Co., a joint venture between the North Korean government's Post and Telecommunications Corporation and Thailand-based Loxley Pacific, took control of North Korea's Internet and address allocation. The satellite link was phased out in favour of the fiber connection and is currently only used as a backup line. In October 2017 a large scale DDoS attack on the main China connection led to a second Internet connection taken into service. This connects North Korea through a fiber optic cable with Vladivostok, crossing the Russia-North Korea border at Tumangang. Internet access is provided by TransTelekom, a subsidiary of Russian national railway operator Russian Railways. North Korea's first Internet café opened in 2002 as a joint venture with South Korean Internet company Hoonnet. It is connected via a land line to China. Foreign visitors can link their computers to the Internet through international phone lines available in a few hotels in Pyongyang. In 2005 a new Internet café opened in Pyongyang, connected not through China, but through the North Korean satellite link. Content is most likely filtered by North Korean government agencies. Since February 2013, foreigners have been able to access the internet using the 3G phone network. "A Quiet Opening: North Koreans in a Changing Media Environment" a study commissioned by the U.S. State Department and conducted by Intermedia and released May 10, 2012 shows that despite extremely strict regulations and draconian penalties North Koreans, particularly elite elements, have increasing access to news and other media outside the state-controlled media authorized by the government. While access to the Internet is tightly controlled, radio and DVDs are common media accessed, and in border areas, television. As of 2011, USB flash drives were selling well in North Korea, primarily used for watching South Korean dramas and films on personal computers. ^ "Country Comparison: Telephones – main lines in use". The World Factbook. CIA. ^ a b c d This article incorporates public domain material from the Library of Congress Country Studies document "North Korea: A Country Study" by Savada, Andreas Matles, ed. (1994). Retrieved on 27 July 2013. Fourth ed. Washington: Federal Research Division of the Library of Congress. ISBN 0-8444-0794-1. ^ "World briefings: North Korea", New York Times, June 4, 2004. ^ "Secretive N Korea set to launch mobile phone service", Associated Press, December 4, 2008. ^ "3세대이동통신서비스 《고려링크》 시작 천리마 속도로 정보통신 현대화 노린다". 민족 21 (94). 2009-01-01. Retrieved 2010-01-31. ^ "Cell phone demand stays strong in North Korea". BusinessWeek. 13 May 2010. Retrieved 23 June 2010. ^ Hamish McDonald (24 December 2011) Father knows best: son to maintain status quo, The Age. ^ Alaa Shahine (2 February 2012). "Orascom Telecom Media Shares Jump After North Korea Announcement". Bloomberg. Retrieved 15 October 2012. ^ "North Korea embraces 3G service". BBC. 26 April 2013. Retrieved 18 May 2013. ^ Williams, Martyn. "How a telecom investment in North Korea went horribly wrong". Retrieved 4 September 2016. ^ Kang (강), Jin-gyu (진규) (2011-06-15). 북한에서도 아이폰 사용 첫 확인. Digital Times (in Korean). Retrieved 2011-07-08. ^ "Secretive N. Korea opens up to cellphones". November 21, 2011. ^ "North Korea recalls mobile phones". The Sydney Morning Herald. 4 June 2004. Retrieved 2 August 2007. ^ Dave Lee. (10 December 2012) North Korea: On the net in world's most secretive nation. Bbc.co.uk. Retrieved on 6 April 2013. 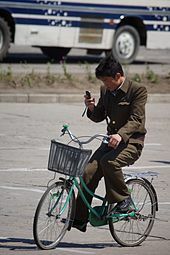 ^ "EXCLUSIVE: Foreigners Now Permitted To Carry Mobile Phones In North Korea - NK News - North Korea News". 19 January 2013. Retrieved 4 September 2016. ^ Gallo, William. "N. Korea Cuts 3G Mobile Web Access for Foreign Visitors". Retrieved 4 September 2016. ^ Kretchun, Nat (10 June 2017). "The Regime Strikes Back: A New Era of North Korean Information Controls". 38 North. U.S.-Korea Institute, Johns Hopkins University School of Advanced International Studies. Retrieved 11 June 2017. ^ a b c Miles, Tom (21 June 2018). "Tackling North Korea's chronically poor sewage 'not rocket science': U.N." Reuters. ^ Andrew Jacobs (January 10, 2013). "Google Chief Urges North Korea to Embrace Web". The New York Times. Retrieved January 10, 2013. ^ "Netflix style video-on-demand comes to North Korea, state TV shows | NK News - North Korea News". 2016-08-18. Retrieved 2016-08-21. ^ Nunez, Michael. "North Korea's Netflix Knockoff Will Stream On-Demand Propaganda". Retrieved 2016-08-21. ^ a b "North Korea's 'Manbang' is a state-approved streaming service". Engadget. Retrieved 2016-08-21. ^ Jakhar, Pratik (15 December 2018). "North Korea's high-tech pursuits: Propaganda or progress?". BBC. ^ Lintner, Bertil (2007-04-24). "North Korea's IT revolution". Asia Times. Retrieved 2007-05-11. ^ Seliger, Bernhard; Schmidt, Stefan. The Hermit Kingdom Goes Online: Information Technology, Internet Use and Communication Policy in North Korea. McFarland. ISBN 9781476617701. ^ "Dot KP domain assigned to Star". North Korea Tech - 노스코리아테크. 2011-05-03. Retrieved 2017-10-03. ^ "DPRK's Internet outage lasted almost two days". North Korea Tech - 노스코리아테크. 2013-03-16. Retrieved 2017-10-03. ^ DeYoung, Karen; Nakashima, Ellen; Rauhala, Emily (2017-09-30). "Trump signed presidential directive ordering actions to pressure North Korea". Washington Post. ISSN 0190-8286. Retrieved 2017-10-03. ^ "Russia Provides New Internet Connection to North Korea | 38 North: Informed Analysis of North Korea". 38 North. 2017-10-01. Retrieved 2017-10-03. ^ Foster-Carter, Aidan (2002-07-06). "North Korea's tentative telecoms". Asia Times. Retrieved 2007-05-11. ^ "First Internet Cafe Opens in Pyongyang". The Chosun Ilbo. 2002-05-27. Archived from the original on February 24, 2007. Retrieved 2007-05-11. ^ "North Korea to offer mobile internet access". BBC. 22 February 2013. Retrieved 15 July 2014. ^ Caitlin Dewey (26 February 2013). "Instagrams from within North Korea lift the veil, but only slightly". Washington Post. Retrieved 15 July 2014. ^ "North Korea blocks access to Instagram". The Guardian. Associated Press. 23 June 2015. Retrieved 23 June 2015. ^ "Illicit access to foreign media is changing North Koreans' worldview, study says". The Washington Post. Associated Press. May 10, 2012. Retrieved May 10, 2012. ^ Nat Kretchun, Jane Kim (May 10, 2012). "A Quiet Opening: North Koreans in a Changing Media Environment" (PDF). InterMedia. Archived from the original (PDF) on June 1, 2012. Retrieved May 10, 2012. The primary focus of the study was on the ability of North Koreans to access outside information from foreign sources through a variety of media, communication technologies and personal sources. The relationship between information exposure on North Koreans’ perceptions of the outside world and their own country was also analyzed. ^ "North Korea's Nascent Consumerism". Asia Sentinel. 19 March 2012. Retrieved 12 April 2017. North Korea Uncovered, (North Korea Google Earth) See most of North Korea's communications facilities, including: The Korea Computer Center, the Pyongyang Television Tower, the KCBS tower, the major communications center in Heaju, as well as satellite communications stations near Pyongyang. This page was last edited on 31 March 2019, at 17:08 (UTC).